In any business, there are a multitude of factors that either impede or improve market share. Simpactful partner and Beauty Industry expert, Kevin Otero, invites leaders to keep abreast of today’s biggest influences in the beauty industry through an inspiring and informative presentation entitled Future Forces — a series of topics relevant to the industry and tailored to a particular audience’s need. Praised for his “real world dynamic scope of knowledge,” according to Sydney Berry, President and Owner of Salon Services North West, Kevin is a practical thought leader who streamlines themes relevant to the Beauty world. Kevin has identified 18 key areas of Future Forces that are and will continue to reshape the Beauty Industry. They range from changing government regulations, to demographic shifts and changes in consumer expectations, technology disruptors, and the evolving role of sales representative. How the Internet of Things, Artificial Intelligence, Machine Learning, Mobile Technology, Robotics, and Apps have changed the beauty landscape. The evolving purchasing habits of this demographic that soon will be the biggest spending group and how their use of technology and shopping expectations are changing what all consumers expect. 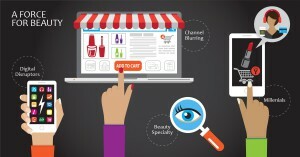 Navigating through the growth of specialty shops like Ulta Beauty, Sephora, and Blue Mercury. Capitalizing on the variety of ways to sell and purchase products and services. To engage his audiences, Kevin creates small discussion groups to assess opportunities, capabilities, challenges and partnerships to find solutions for greater growth. To learn more or contact Kevin, please email us at contact@simpactful.com or call 925-234-6394. Kevin has spent nearly three decades creating opportunities for growth in over 60 countries. As a former VP at Procter & Gamble, and COO of Salon Professional, he has deep experience in creating turnaround strategies, sales and brand building, distribution networks, partnerships and mergers and acquisitions. Click below to learn more about Kevin and his experience within the beauty industry. Simpactful is a team of veteran business executives driving success for companies and organizations of all kinds. Through our multidisciplinary skillset, we represent the best in professional executives from both sides of the desk — whether in CPG manufacturing or retailer experience. We share our knowledge with our clients and follow-through with exceptional results.